Tyrannosaurus rex (meaning "Tyrant Lizard" "King") is the most famous of all the giant predatory land carnivore dinosaurs. Its notable massive skull and armor piercing serrated teeth are counter balanced with its massive 6-7 ton frame and a long, solid, rigid tail. The skull was more than 4.5 feet (1.35M) long, with teeth 6-12 inches long. It is estimated by its jaw size that it could have ripped-off 500 pounds (230 kg) of flesh in a single bite. It had huge bi-pedal legs that gave it an ability to run at great speeds. Its’ large feet and legs may have been designed to hold down prey. It was considered a skilled hunter and scavenger. The size of this prehistoric animal was 30-40 feet (12M) long and 15-18 feet (6M) tall. 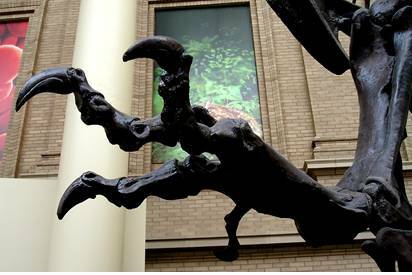 It had two small fingered arms that were physically well-developed, but about three feet long. It had a keen sense of smell and a well-developed binocular vision. It has been suggested that most dinosaurs could see in color, like birds, and therefore, many dinosaurs may have been extremely colorful. 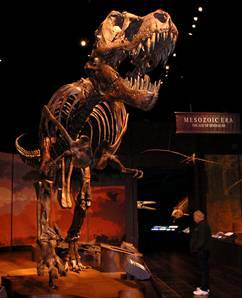 This king of the dinosaurs lived during the late Cretaceous Period about 70 Million years ago and went extinct 65 Million years ago. 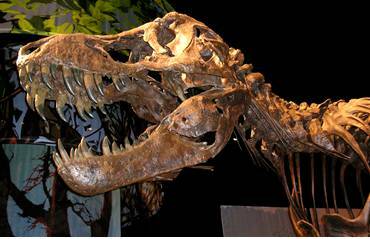 More than 30 specimens of T-Rex have been discovered.